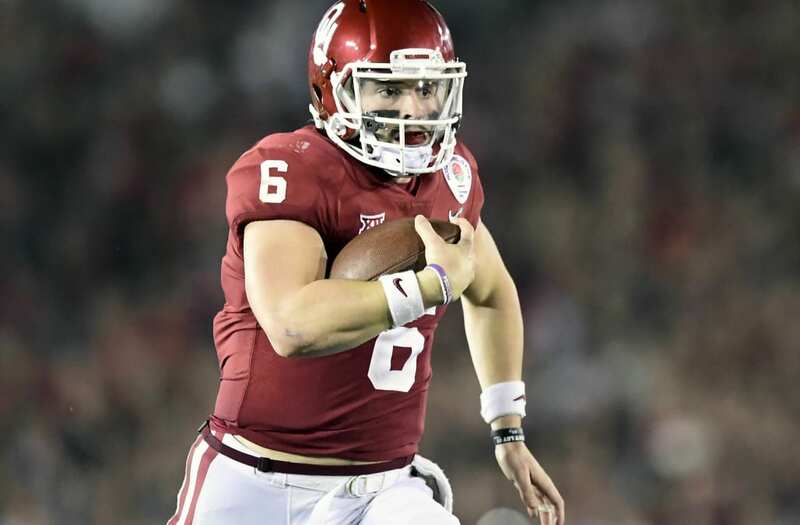 A well-connected NFL executive with ties to the Cleveland Browns told ESPN's Adam Schefter that the Browns could take quarterback Baker Mayfield with the No. 1 pick in the NFL Draft on Thursday. It is still unknown who the Browns will take, but most experts believed it would either be Josh Allen or Sam Darnold. Schefter notes that another prominent executive working with the Browns is a big Mayfield fan and may believe he is the best quarterback in the draft. A new report from ESPN's NFL insider Adam Schefter is going to shake up a lot of mock drafts just days before the 2018 NFL Draft. According to Schefter, a "very, very well-connected NFL Executive" with connections to the Cleveland Browns, says Baker Mayfield is a candidate to be the No. 1 pick in the NFL Draft on Thursday. "A very, very, well-connected NFL executive (who has connections to the Browns organization) said to me, 'Hey, Baker Mayfield, just so you know, is square in the conversation to become the No. 1 overall pick. '," Schefter said on ESPN's "Get Up." Schefter clarified that this does not mean the Browns will take Mayfield and that Browns General Manager John Dorsey maybe the only person in the world who knows which player will be selected. But Schefter did say there is other evidence that the Browns could take Mayfield, including a prominent executive who is a "big, big fan" of the Oklahoma quarterback. "[Former Redskins GM and current Browns consultant] Scot McCloughan is a big, big Baker Mayfield fan here," Schefter said. "And Scot McCloughan, I believe, he believes that Baker Mayfield may just be the best quarterback in this draft class. So, when he believes that and when there is another person, who has connections to the Browns organization, who tells me, 'Hey, don't take your eyes off Baker Mayfield here,' that just goes to tell you this conversation goes beyond Josh Allen and Sam Darnold, who we had been discussing and speculating for weeks now, that they would be in play to be the No. 1 overall pick." In a recent survey of 13 NFL Draft experts, Mayfield had an average draft position of 6.5 overall and wasn't projected to go any higher than No. 3 to the New York Jets. Of those experts, nine had Allen going No. 1, and the other four speculated that the Browns would take Darnold.